Be sure to check these out - great reading. And while you're there, follow the blogs. Thanks! Thanks, Jo--I'll go check some of the others out:). 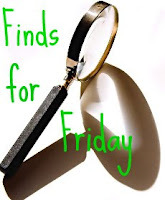 Just checking in with you and checking your list of finds too:)) Hope your weekend has been awesome and you are up for a good week:) No results yet!